If you’ve been out of your house in 2013, you must have seen Hipanema bracelets everywhere.. These bracelets come into being after 2 girls who travelled the world, thought about a solution to wear Brazilian/Friendship bracelets at the time you choose rather than all the time until the bracelet breaks. They got the simple but genius idea to tight together multiple strings in a unique bracelet magnetized clasp. Typically, within the components of a Hipanema bracelet, you will find a friendship bracelet, some beads work and other bits and bobs. Last summer, I looked at many of these bracelets but I didn’t buy any as they are costly (around £70) and for that price, I wanted to wait for the one that I would really love, but I didn’t find it. Also, when my mom told me about a craft workshop place in Belgium and that I discovered that they were giving a Hipanema style bracelet workshop on the weekend I was visiting my family, I thought this would be the perfect opportunity to make one bracelet that will match my tastes. So last Saturday morning, I went with my mom to La boite à Bonheur in Seraing, near Liege, to attend the workshop. Because of a lack of time, we went for a bracelet only including ready-made pieces, and already like this, it took me 2 hours to select my bits and put them all together. 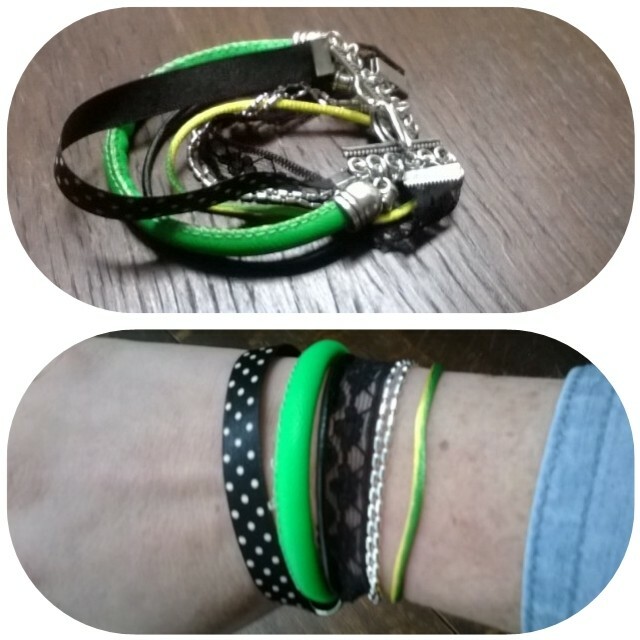 My selection was made of 1 black ribbon with white dots, funky green leather, black leather, a double chain, a piece of black lace and a yellow and green braid. I didn’t go for a magnetized clasp, but went for a more traditional one. I am pretty happy with the result , although it’s miles away from an Hipanema, missing the mandatory Friendship piece, and some beads. But I’ll make more of these, to be ready for next summer!